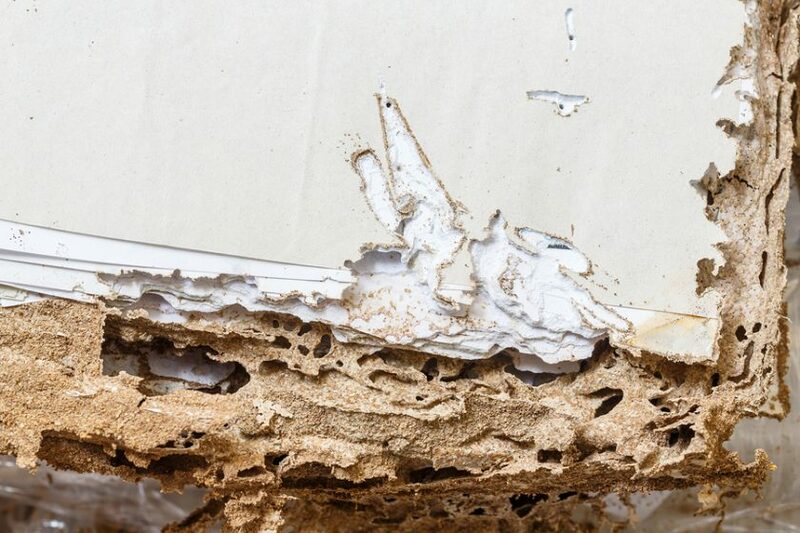 Termites are destructive insects that chew relentlessly on dead materials and cellulose. These materials include wooden structures. A termite infestation can affect the integrity of any structure, resulting in millions of dollars in property damage! If you suspect that your home has a termite problem, take action immediately so the insects will not spread to other parts of your home that could lead to expensive repairs. Termites come in two groups: subterranean termites and wood termites. To determine what measures to take to eliminate the pests, you have to know what you are up against. Subterranean termites live underground, building colonies on the soil. A mud tube formation propped against the external wall of a structure is a telltale sign that your property is infested with subterranean termites. Wood termites will chew their way into any piece of wood. Telltale signs of wood termite infestation include discarded wings in the affected area, sawdust, cracked or damaged paint finishes and droppings. A cardboard trap is an easy and practical way to lure termites out of your home. Essentially, you will attract female termites using cellulose. The cardboard’s aroma will lure the females out from their colony, making it easier for you to collect these pests and burn the entire cardboard. Because all the females are gone, the colony is unlikely to reproduce and grow. Termites are extremely sensitive to sunlight. They will literally die when exposed to light and heat. If you are dealing with subterranean termites, clear the area of vegetation so none of the termites can escape the sunlight. Then, dig up sections of the mud mound to expose the termites to direct sunlight. For termite-infested furniture, bring all the furnishings out and air them out on the hottest part of the day (10AM to 3PM). Termites need water to survive. Without moisture, the entire colony will die out. Make sure the property is completely dry so the termites have no water supply. Look at the parameters of the structure and eliminate spots where water is pooling. Repair any leaks, especially those near your home’s foundation. Did you know that certain types of parasitic critters feed on termites? By introducing termites’ natural predator in the colony, you can protect your home from an infestation. Nematodes are a type of parasitic worms that love to nosh on termites. Just get dozens of these worms and put them in the colony of subterranean termites. The nematodes will do the rest. Orange oil is an effective termite repellant. Wood termites, in particular, hate this stuff! Just spritz orange oil on the affected areas of the home and watch termites drop dead. If you are out of orange oil, you can use neem oil as an alternative. Just like orange oil, neem oil effectively kills termites, particularly subterranean termites! Borax is a white powder comprised of colorless crystals. This compound is an excellent non-toxic termite repellant. It eliminates termites by disrupting the critters’ digestion, causing death. Borax is safe for children and pets. To use borax as a treatment for termite infestation, scatter the powder all over the targeted area. You can also mix a generous amount of borax with water and spritz the solution directly on the termite mound.